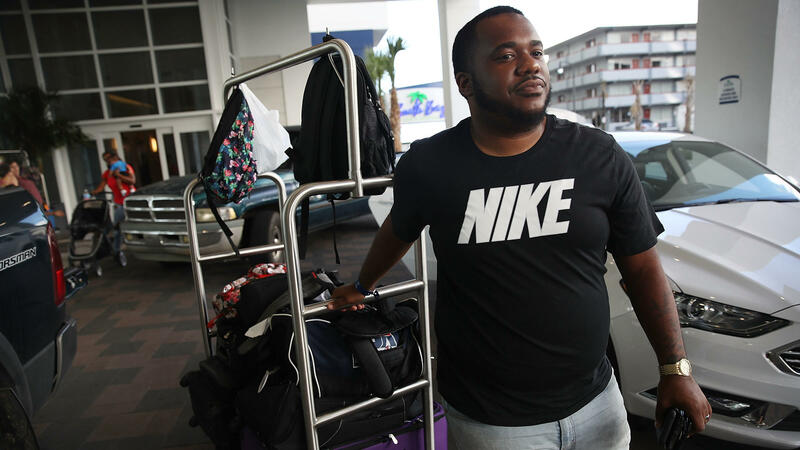 Marcus Thurston and his family leave their hotel in Myrtle Beach, S.C., on Tuesday, cutting their vacation short ahead of Hurricane Florence's arrival. People at Wrightsville Beach in North Carolina hurry to board up Tuesday in anticipation of Hurricane Florence. More than 1 million people are under evacuation orders in the Eastern United States. Hurricane Florence, as seen from the International Space Station on Monday, gains strength in the Atlantic Ocean as it moves west. And in coastal Virginia, while the sun was shining and the sky was blue, the state's emergency management website crashed as hundreds of thousands of people tried to look up mandatory-evacuation maps. All told, more than 1 million people are under mandatory-evacuation orders, according to the Federal Emergency Management Agency. Many more are being urged to evacuate at-risk areas voluntarily. "This is not a storm that you need to try to ride out," North Carolina Gov. Roy Cooper said at a news conference Tuesday. "It's historic and maybe once in a lifetime. "I know that North Carolinians are a hardy bunch and we've seen nor'easters and hurricanes before, but this one is different," he said. "And we want to make sure that people know that, because they're risking their lives when they stay." "We can also surge to the west to find other shelter as needed," he said Tuesday. 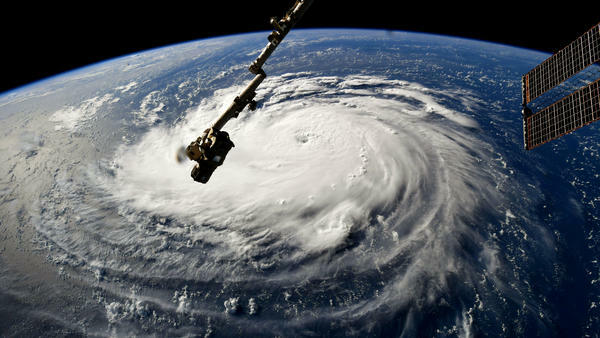 FEMA recommends that anyone fleeing a hurricane take an emergency supply kit — including several days' worth of water, food and any necessary medical supplies, as well as flashlights, extra batteries, a first-aid kit and baby wipes for personal hygiene. DeHaan does not expect fuel supply to become as urgent a problem with Florence as it was with hurricanes Harvey and Irma, because refineries are not in the path of the storm. But lines are starting to form at gas stations, and shortages are increasing — particularly in Wilmington, N.C.
"It's really now becoming a crunch against time to fill up ahead of the storm," he says. Nursing homes often face a dilemma as storms approach, as Tom Akins, the CEO of Leading Age in North Carolina, which works with retirement communities, tells NPR's All Things Considered. Evacuations carry serious health risks for residents, but sometimes, the hazard of staying in place is just too great, Akins says. "If you think about a person who is in a nursing facility, and who has lost lots of independence and lots of ability, and you magnify the angst that you or I would feel if we are in this situation by a thousand times — it probably doesn't approach how they feel about what's about to happen," he says. Virginia Gov. Ralph Northam says local resources are available to help people who might have difficulty leaving their homes. When traveling is difficult, he says, it's even more important evacuate in advance. "We want to make sure that they have plenty of time to get to higher ground," he told NPR on Tuesday. However, the AP reports that some shelters in Virginia won't be opening until Wednesday or Thursday. Anti-price-gouging laws are now in effect in North Carolina and South Carolina; anyone witnessing exorbitant prices on gas, lodging or food along evacuation routes can complain to the attorney general's office. "Some schools in the inland counties will be used as shelters," McMaster tweeted about that move. He added, "we want to keep the roads as clear as possible for the one million evacuees we are expecting." Colleges and universities in the Carolinas have canceled classes, with some preparing to be shut well into next week, NPR's Elissa Nadworny reports. "For UNC students with no other housing options, the branch in Asheville has set up cots to house displaced students," she says. And it's not just people getting away from the coastline. And commercial airliners are sending 787s from Charleston, S.C., to Paine Field in Washington state — the airport that serves a Boeing manufacturing plant — for safekeeping, according to Flightradar24 and a Seattle aviation reporter. At least six North Carolina counties are now under complete or partial mandatory-evacuation orders: Brunswick, Currituck, Dare, Hyde, New Hanover and Onslow. In addition to those local evacuation orders, Cooper ordered state-level mandatory evacuations for North Carolina's barrier islands. "The state, to our knowledge, has never issued an evacuation order," Cooper said Tuesday. "This is the first of its kind." "Don't bet your life on riding out a monster," he said. "If you wait until conditions get bad, it may be too late to get out safely, and you also put first responders at risk." ABC's Gio Benitez, reporting from the Outer Banks, says authorities are urging people to leave well ahead of the storm to avoid being stranded on those bridges. "If they're on this road, on this highway when the storm hits, you're going to have a very dangerous storm surge," he reports. "It's going to be a very dangerous situation." Farther south, in the coastal city of Wilmington, even bars that have never shut for a storm before are taking Florence seriously, the Wilmington Star News reports. 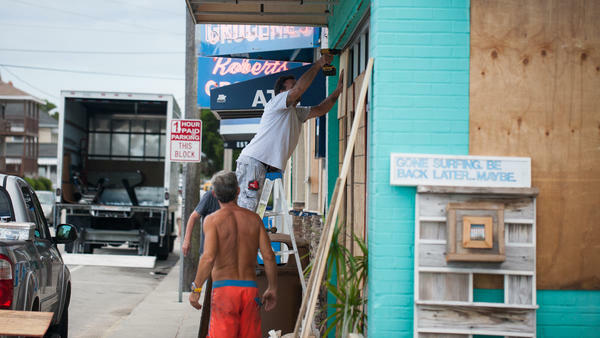 The newspaper called the tone "more cautious than celebratory," with owners eyeing closures rather than prepping hurricane parties. McMaster initially ordered a full coastal evacuation effective at noon on Tuesday, issuing a a mandatory order for residents in hurricane evacuation zones along the state's entire coast. "We will be a safe house for those in need. Of a drink," one bar told its fans. MacDougall Correctional Institution is in the mandatory-evacuation zone and a spokesman says officials are monitoring the situation to determine whether to evacuate the prison. Interim Communications Director Dexter Lee notes that the facility suffered no structural damage during Hurricane Hugo in 1989 and that inmate movements are not announced in advance for security reasons. The National Weather Service in Charleston provided an update on Tuesday urging residents to take the risk seriously, emphasizing that Florence could have widespread effects and it is difficult, at this stage, to predict the exact impact. "We're certainly hoping for the best, but we want you to prepare for the worst," Bright said. "We need you to be prepared for potentially extreme impacts." In Virginia, Northam issued a mandatory-evacuation order for coastal residents in "Zone A" — an area that includes parts of Hampton Roads and the Eastern Shore. The order took effect at 8 a.m. ET Tuesday. "Caldwell said the state is considering opening its own shelters later this week if the local shelters fill to capacity," the AP reports. NPR's Sarah McCammon, whose neighborhood in Virginia Beach is under an evacuation order, reports that as of Tuesday morning, the area was "pretty quiet." "It really, so far, feels like any normal day," she says. "A lot of people are still around." NPR's Colin Dwyer contributed reporting to this story.